CAT ATTACK: Anna Teague had a burst in the midfield last week. Geelong’s VFLW team will head north to warmer climes this weekend. The Cats will take on the Northern Territory Thunder in Darwin tomorrow. Geelong sits third on the ladder and its coming off their first loss of the season last week against the Western Bulldogs. The Thunder are just half a game behind Geelong in fourth place. Geelong’s defence has been the second best in the competition this season, but the Thunder have been far the best offensive side. Both sides are coming off surprise losses last week. The Cats were trounced in the first quarter against the Dogs and never recovered. The Dogs led by 20 points at the first break and although Geelong kept the lead at bay for the final three terms, the damage had already been done. Hayley Treaven was in the best players again with the 2017 Carlton AFLW forward busy around the packs. Maighan Fogas has been a stand out player this season. The 2017 Redan premiership captain has rarely been missing from the best players each week. Former WNBL and Geelong Supercats basketballer Maddie McMahon has made a seamless transition to the oval ball while former Carlton midfielder, Maddy Keryk also continued her good form for the Cats. More scoreboard pressure is sure to be coach Paul Hood’s main focus tomorrow. 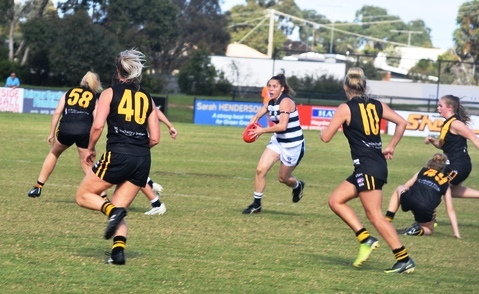 The Cats had to wait until early in the final term for their first, and only, goal last week, courtesy of the returning Kate Darby. The Bulldogs were relentless in defence thanks to strong games from Libby Birch and Naomi Ferres. Debutante Mickayla Ward kicked two goals while AFLW vice-captain Ellie Blackburn also hit the scoreboard. Hood tried some positional changes last week, including giving Anna Teague a spell in the midfield and moving McMahon to centre half back for the final term. The Cats will regain midfielder Richelle Cranston and defender Rebecca Pearce, who were both rested ahead of the long trip to the Top End. The Thunder were blown away by a third-quarter Collingwood blitz in Darwin last weekend. Sophie Alexander smashed through the NT defence with four goals. The Cats will also need to keep an eye on NT forward Jasmyn Hewett, who has a knack of bobbing up with important goals at crucial stages. A loss tomorrow could see Geelong slip to fifth on the ladder if Darebin defeats Collingwood.